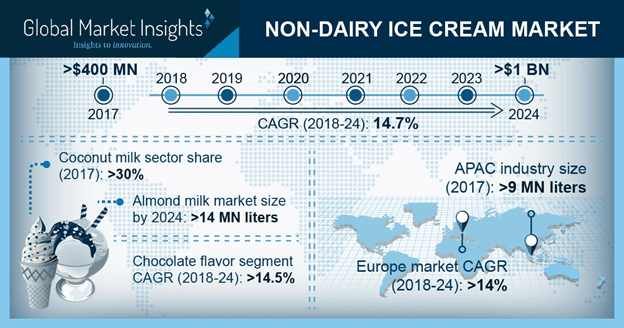 Non-Dairy Ice Cream Market size is estimated to surpass USD 1 billion by 2024; according to a new research report by Global Market Insights, Inc. Shifting consumer preference towards innovative products and flavors due to changing social trends will drive the non-dairy ice cream market size. Technological advancements in machineries and product innovations using avocado and hemp milk will augment the product adoption. Increasing raw material availability along with convenient production process are among major factors supporting the industry growth. Global non-dairy ice cream market share is highly fragmented with presence of both regional and global companies. Notable players include General Mills, Unilever, Talenti, Booja Booja, Danone, Tofutti Brands, Bliss Unlimited LLC, Swedish Glace, and NadaMoo. Merger & acquisitions along with product innovations are among key strategies adopted by manufacturers. For instance, in April 2017, Danone completed acquisition of WhiteWave Foods, an American packaged food manufacturer to expand its industry share.